The Japonic or Japanese–Ryukyuan language family includes the Japanese language, spoken in the main islands of Japan, and the Ryukyuan languages, spoken in the Ryukyu Islands. The term Japonic was coined by Leon Serafim and the family is universally accepted by linguists. The common ancestral language is known as Proto-Japonic or Proto-Japanese–Ryukyuan. The essential feature of this classification is that the first split in the family resulted in the separation of all dialects of Japanese from all varieties of Ryukyuan. According to Shirō Hattori, this separation occurred during the Yamato period (250–710). Eastern Japanese, including most dialects from Nagoya east, including the modern standard Tokyo dialect. Western Japanese, including most dialects west of Nagoya, including the Kyoto dialect. Kyushu dialects, spoken on the island of Kyushu. Kagoshima dialect/Satsugū dialect, spoken in Kagoshima Prefecture in southern Kyushu. Hachijō language, spoken on Hachijō-jima and the Daitō Islands, including Aogashima. Ryukyuan languages, originally and traditionally spoken throughout the Ryukyu Islands chain; most are considered "definitely" or "critically endangered" due to the influence of mainland Japanese which followed the conquest of the Ryukyu Kingdom by Meiji Japan. Most are considered dialects of Japanese in Japan, despite little intelligibility with Japanese or even amongst each other. Northern Ryukyuan languages, spoken in the northern part of the Ryukyu Islands chain, consisting of the major Amami and Okinawa Islands. Amami, spoken in most of the Amami Islands, particularly Amami Ōshima, Kikaijima, and Tokunoshima. Kunigami/Okinoerabu-Yoron-Northern Okinawan dialects, spoken in the northern part of Okinawa Island, and neighboring islands of Okinoerabujima and Yoronjima. Main dialect spoken in the cities of Nakijin and Nago. (Central) Okinawan, spoken in the central and southern parts of Okinawa Island, and neighboring islands. Main dialect spoken in Naha, and the former city of Shuri. Southern Ryukyuan languages, spoken in the southern part of the Ryukyu Islands chain, comprising the Sakishima Islands. Miyako, spoken in the Miyako Islands, with dialects on Irabu and Tarama. Yaeyama, spoken in the Yaeyama Islands, with dialects on each island, but primarily Ishigaki Island, Iriomote Island, and Taketomi Island. Yonaguni, spoken on Yonaguni Island, is distinct from the language and dialects of the other Yaeyama Islands. Chapter 37 of the Samguk sagi (compiled in 1145) contains a list of pronunciations and meanings of placenames in the former kingdom of Goguryeo. As the pronunciations are given using Chinese characters, they are difficult to interpret, but several of those from central Korea, in the area south of the Han River captured from Baekje in the 5th century, seem to correspond to Japonic words. Scholars differ on whether they represent the language of Goguryeo or of people they conquered. A single word is explicitly attributed to the language of the southern Gaya confederacy. It is a word for 'gate', and appears similar in form to the Old Japanese word to2 with the same meaning. Alexander Vovin suggests that the ancient name for the kingdom of Tamna on Jeju Island, tammura, may have a Japonic etymology tani mura 'valley settlement' or tami mura 'people's settlement'. Proto-Japonic, the proto-language ancestral to all present-day Japonic languages and dialects reconstructed using the comparative method, has been reconstructed by Martin (1987) and Vovin (1994). Reconstructed Proto-Japonic forms from Vovin (1994: 109–111) are given below. The relationship of the Japonic (or Japanese–Ryukyuan) languages to other modern languages and language families is controversial. There are numerous hypotheses, none of which is generally accepted. 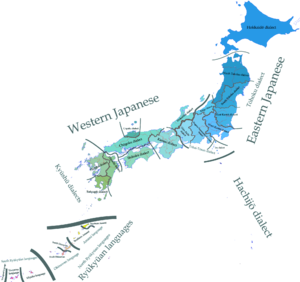 Japonic is classified as an isolated language family and shows in its proto-form strong similarities to Southeast Asian languages. ^ Hammarström, Harald; Forkel, Robert; Haspelmath, Martin, eds. (2017). "Japonic". Glottolog 3.0. Jena, Germany: Max Planck Institute for the Science of Human History. ^ Heinrich, Patrick. "What leaves a mark should no longer stain: Progressive erasure and reversing language shift activities in the Ryukyu Islands" Archived 2011-05-16 at the Wayback Machine, First International Small Island Cultures Conference at Kagoshima University, Centre for the Pacific Islands, February 7–10, 2005; citing Shiro Hattori. (1954) Gengo nendaigaku sunawachi goi tokeigaku no hoho ni tsuite ("Concerning the Method of Glottochronology and Lexicostatistics"), Gengo kenkyu (Journal of the Linguistic Society of Japan), Vols. 26/27. ^ a b Vovin, Alexander (2013). "From Koguryo to Tamna: Slowly riding to the South with speakers of Proto-Korean". Korean Linguistics. 15 (2): 222–240. doi:10.1075/kl.15.2.03vov. ^ Lee, Ki-Moon; Ramsey, S. Robert (2011). A History of the Korean Language. Cambridge University Press. pp. 37–43. ISBN 978-1-139-49448-9. ^ a b Vovin, Alexander (2017). "Origins of the Japanese Language". Oxford Research Encyclopedia of Linguistics. Oxford University Press. doi:10.1093/acrefore/9780199384655.013.277. ^ Janhunen, Juha (2010). "Reconstructing the Language Map of Prehistorical Northeast Asia". Studia Orientalia. 108: 281–304. ... there are strong indications that the neighbouring Baekje state (in the southwest) was predominantly Japonic-speaking until it was linguistically Koreanized. ^ Beckwith, Christopher (2007). Koguryo, the Language of Japan's Continental Relatives. BRILL. pp. 50–92. ISBN 978-90-04-16025-5. ^ Lee & Ramsey (2011), pp. 46–47. ^ Beckwith (2007), p. 40. ^ Martin, Samuel E. 1987. The Japanese Language through Time. New Haven & London: Yale Univ. Press. ^ Vovin, Alexander. 1994. "Long-distance Relationships, Reconstruction Methodology, and the Origins of Japanese". Diachronica 11(1): 95–114. ^ Kindaichi, Haruhiko (2011-12-20). The Japanese Language. Tuttle Publishing. ISBN 9781462902668. Archived from the original on 2017-03-22. ^ Alexander, Vovin. "Proto-Japanese beyond the accent system". Current Issues in Linguistic Theory: 141–156. Archived from the original on 2018-05-11.